Inspiration for your three-day weekend: explore Soaring Eagle Park! Take advantage of this three-day weekend and hike Soaring Eagle Park! Celebrate the red, white and blue by enjoying the gorgeous weather and the great outdoors. Soaring Eagle Regional Park is 600 acres of mature forests, wetlands, and wildlife habitat. The park features 12 miles of trails that are regularly used by hikers, mountain bikers and equestrians. The Pipeline Trail crosses through the park and is wide and flat—in fact, it is quite common to see families with baby strollers out enjoying the trail. It’s a short 35 minute drive from downtown Seattle and so it’s perfect for a day trip. Pack a lunch and take your time exploring. The natural area provides sanctuary for black bear, bobcat, black tail deer and more than 40 species of birds. Bring your binoculars and keep your eyes peeled for our furry friends! 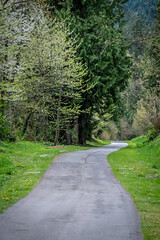 Access: The main entry is on the west side of the park in Sammamish via 228th Avenue SE and SE 8th Street to the end of East Main Drive where a paved parking lot can accommodate up to five horse trailers. The address is 26015 East Main Drive.